62 | TH E M R EP O RT O R I G I NAT I O N S E R V I C I N G A NA LY T I C S S E C O N DA R Y M A R K E T SECONDARY MARKET SECONDARY MARKET THE LATEST Fannie Mae to Pay $3 Billion in Dividends The GSE's revenues, income, and net worth are on the rise. F annie Mae reported net income of $3.2 billion, comprehensive income of $3 billion, and a positive net worth of $4.2 billion for the third quarter. That means that Fannie Mae expects to pay the U.S. Department of Treasury a $3 billion dividend in December. Net revenues were up for the GSE. In Q 3 net revenues were $5.6 billion. In Q2, they were $5.5 billion. Similarly, net interest in - come rose from $5.3 billion to $5.4 billion for the third quarter. Fannie Mae's Q 3 net income of $3.2 billion was an increase from Q2's net income of $2.9 billion and from Q 3 2015's net income of $2.2 billion. Overall, Fannie Mae took the report as positive news, which it has not often been able to do in recent years. "Today's results reflect the strength of our business and our commitment to delivering in - novations that make the mortgage process better for lenders," said Timothy Mayopoulos, president and chief executive officer of Fannie Mae. "We have partnered with lenders to develop new solutions that meet their most important needs. 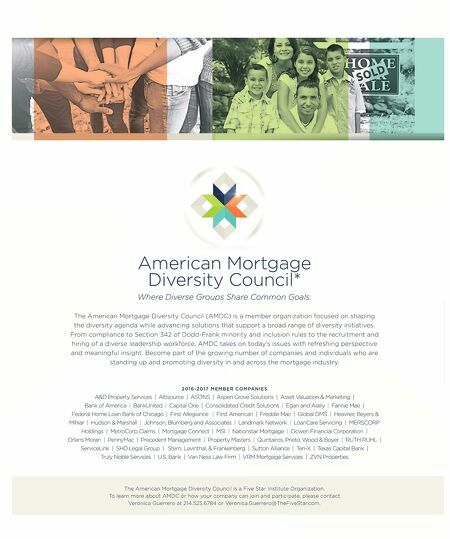 We will continue to innovate, so that we can help customers create a faster, safer, and, ultimately, fully digitized mortgage experience for borrowers." Net fair value losses were down. In Q 3 they were $491 million, compared with $1.7 billion in Q2. Fannie Mae attributed the Q 3 loss - es mainly to losses on Connecticut Avenue Securities debt. Credit-related income was also down in Q 3. Fannie Mae reported $563 million in credit-re - lated income in the third quarter, compared with $1.5 billion in Q2. Fannie Mae attributed this to an increase in home prices, including distressed property valuations. Single-family net income was $1.9 billion in Q 3, driven primarily by guaranty fee income and credit-re - lated income. This was also a drop. In Q2, the total was $2.7 billion. Single-family guaranty fee income remained at $3.3 billion for Q 3. Fannie Mae's solid Q 3 report came two days after Freddie Mac announced a net income of $2.3 billion for Q 3, more than double its Q2 net income of $993 million. Home Price Appreciation May Call for Higher Conforming Loan Limits A new index shows home prices have risen 5.3 percent year-over-year. B lack Knight Financial Ser- vices' most recent Home Price Index (for August 2016) reported home price appreciation of 5.3 percent over-the-year and a median price of $266,000, up 33 percent from the market's bottom and just 0.7 percent from a new national peak. 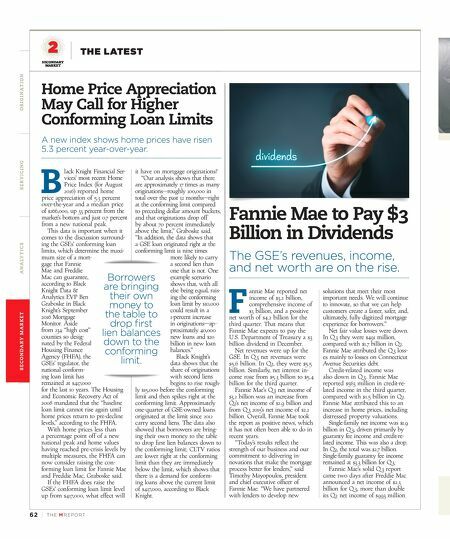 This data is important when it comes to the discussion surround - ing the GSEs' conforming loan limits, which determine the maxi- mum size of a mort- gage that Fannie Mae and Freddie Mac can guarantee, according to Black Knight Data & Analytics EVP Ben Graboske in Black Knight's September 2016 Mortgage Monitor. Aside from 234 "high cost" counties so desig - nated by the Federal Housing Finance Agency (FHFA), the GSEs' regulator, the national conform - ing loan limit has remained at $417,000 for the last 10 years. The Housing and Economic Recovery Act of 2008 mandated that the "baseline loan limit cannot rise again until home prices return to pre-decline levels," according to the FHFA. With home prices less than a percentage point off of a new national peak and home values having reached pre-crisis levels by multiple measures, the FHFA can now consider raising the con - forming loan limit for Fannie Mae and Freddie Mac, Graboske said. If the FHFA does raise the GSEs' conforming loan limit level up from $417,000, what effect will it have on mortgage originations? "Our analysis shows that there are approximately 17 times as many originations—roughly 100,000 in total over the past 12 months—right at the conforming limit compared to preceding dollar amount buckets, and that originations drop off by about 70 percent immediately above the limit," Graboske said. "In addition, the data shows that a GSE loan originated right at the conforming limit is nine times more likely to carry a second lien than one that is not. One example scenario shows that, with all else being equal, rais - ing the conforming loan limit by $10,000 could result in a 1-percent increase in originations—ap - proximately 40,000 new loans and $20 billion in new loan balances." Black Knight's data shows that the share of originations with second liens begins to rise rough - ly $15,000 before the conforming limit and then spikes right at the conforming limit. Approximately one-quarter of GSE-owned loans originated at the limit since 2012 carry second liens. The data also showed that borrowers are bring - ing their own money to the table to drop first lien balances down to the conforming limit; CLTV ratios are lower right at the conforming limit than they are immediately below the limit, which shows that there is a demand for conform - ing loans above the current limit of $417,000, according to Black Knight. Borrowers are bringing their own money to the table to drop first lien balances down to the conforming limit.